I loved this sweet story about a third-grade Korean-American girl. Clara Lee goes by her first and last name because, "It just sounds better that way. Like peanut butter and jelly, like trick-or-treat, or fairy and princess, those words just go together. Just like me, Clara Lee." Clara Lee has a lot of personality, and this realistic fiction novel offers a fun look at her family, school and friends. The illustrations keep the story moving along perfectly, and bridge the gap for kids who are just transitioning in to reading longer chapter books. Do you remember looking up to high school students, who seemed like the most grown-up, sophisticated, worldly individuals? 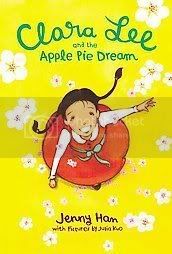 Clara Lee's fondest dream is to win the Little Miss Apple Pie contest, and ride in a parade float, standing proudly next to the high school student who wins the Miss Apple Pie title during their town's yearly Apple Festival. In order to win, she's got to deliver a speech in front of the whole school, which makes her very nervous. She has a bad dream the night before, which her grandfather tells her is actually a sign of good luck. Greatly cheered by this news, she goes on to have the luckiest day ever: she gets the best seat on the school bus, she manages to do well in gym class, her friend gives her gingersnap cookies (her favorite!) and she finds an awesome candy necklace, which she decides will be her "signature look" from now on. Kids will enjoy the hand-lettered list Clara Lee creates documenting all of her lucky occurrences. When her luck starts to run out, Clara Lee begins to worry. With an obnoxious "mean girl" classmate reminding Clara that "American as apple pie" usually means blonde and blue-eyed, NOT Korean-American, she's genuinely concerned. Does she still have a shot at winning the contest? Happily, the answer is "yes" and she's able to ride the float wearing her best Korean dress. I'll be recommending this charming book for 8-12 year-old readers who enjoyed Megan McDonald's Judy Moody series or the Clementine books by Sarah Pennypacker. I adore public speaking, so I frequently have to remind myself that not everyone enjoys being put on the spot that way! Right Madigan. Public speaking engagements don't come automatically a pleasure to everyone. Some might frequent hiding behind curtains or curling up on the backstage.